It’s that time again when hundreds of thousands of visitors travel to Hannover in Germany for the world’s biggest farm machinery show. Held every two years Agritechnica is on every machinery enthusiast’s bucket list as the latest developments in hardware, software and technology are unveiled. There are 23 massive halls, each full to the brim of shiny new tractors, combines, telehandlers and other machinery, for the visitors to admire – but it’s impossible to visit all those halls in one day. With that in mind, Agritechnica runs for seven days from Sunday, November 11 to Saturday, November 18. Organiser DLG (Deutsche Landwirtschafts-Gesellschaft, the German Agricultural Society) says it is expecting numbers of over 400,000 to visit the show, similar to the crowds that came to the 2015 event. ‘Digitalisation’, ‘autonomous’, ‘connectivity’ and ‘smart’ seem to be the key buzz words at this year’s Agritechnica as more manufacturers offer their latest technology to customers who are becoming more accepting of it as time goes on. Alternatives to diesel is also a common talking point on the Agritechnica stands with many mainstream manufacturers offering up electric and even methane powered engines. However, the general opinion from the key players is that diesel is here to stay for the next 10 years at least. Hermann Lohbeck, from German tractor and machinery manufacturer Claas, says his company "can see no real alternative to diesel to power agriculture engines in the next five to 10 years". "Of course we are looking at the alternatives," he adds, "but I think it is too early for them." Some of the other highlights noted in Hannover this week include a tractor entirely powered by electricity, a silage system that can work continually even if there is no trailer to fill alongside it, and a new breed of tractor on offer from India’s Mahindra. 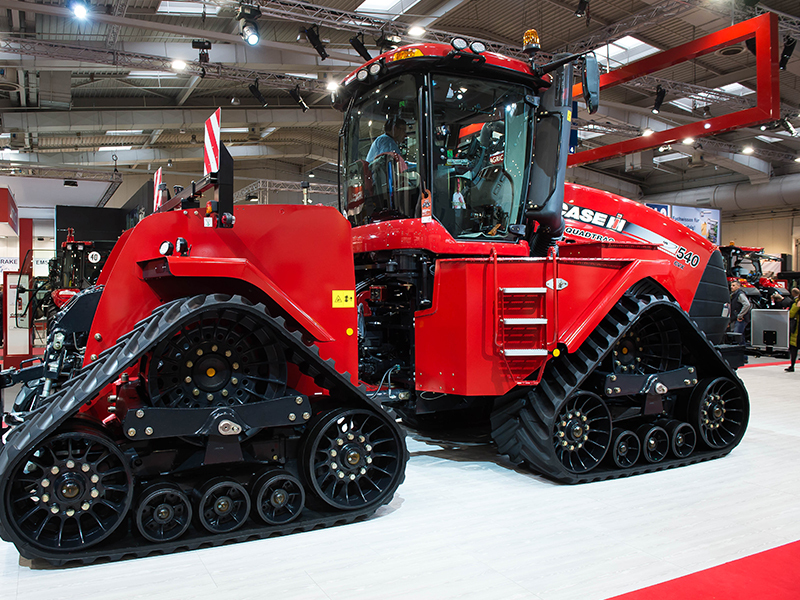 And, it wouldn’t be a proper Agritechnica if there were no massive machines on show such as the new Case IH Quadtrac 540 CVX which, with 613 peak horsepower, is the flagship in the Quadtrac CVX range.